The original publisher of the sequel to Jewels of the Oracle was supposed to be Corel. 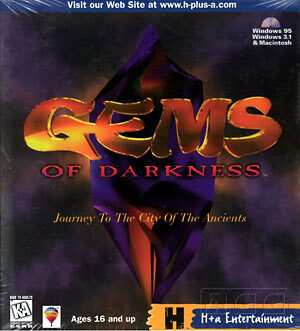 It was going to be called Gems of Darkness. Along the way, however, the interactive games division of Corel got sold to H+A and then they sold it to Dreamcatcher - the company that acquired the rights to the original Jewels game. That's why the boxes look similar. The game received wonderful reviews, but the 20th Century was drawing to a close and so was the interactive CD-ROM game business. 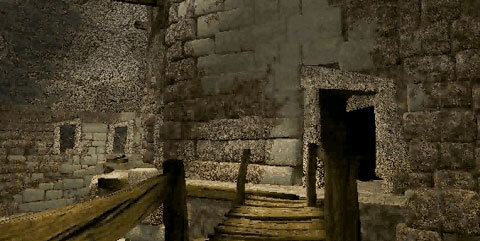 Riven (the sequel to MYST) came out a year after GEMS. It made a lot of money, but the SONY Playstation and Microsoft XBOX would soon take over as the hardware platform of choice. 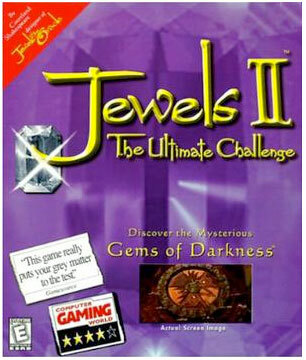 GEMS was the original name of the Jewels sequel. This was my package design. H+A did actually manufacture a version. They took it to E3 as part of their catalog, but had no idea of the international CD-ROM game market at the time. They really missed their chance to score. They were a small cottage company that had published some minor children's discs. They ended up folding, but not before signing over the distribution rights to DreamCatcher Interactive so the "Jewels" name could be resurrected. By then I was working in Connecticut for a web development company and had given up all hopes of Jewels ever making me any money. Here's the interactive map from the game. 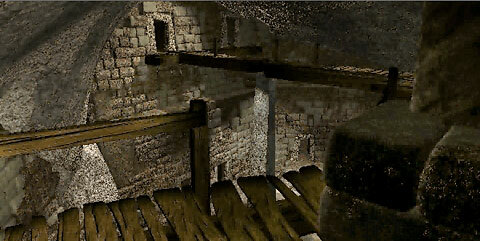 Although you could walk around in the virtual environment, From the first game I learned navigation was one of the most critical elements of the game. If it became repetitive or tedious, players would get frustrated. 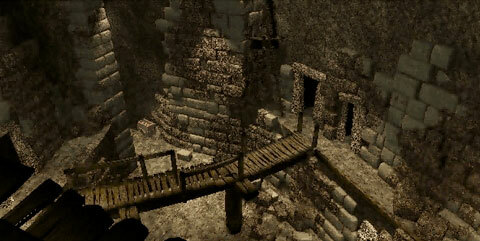 This map gave the player the ability to jump from room to room without navigating via rendered video clips. This is the token box used as a progress chart. 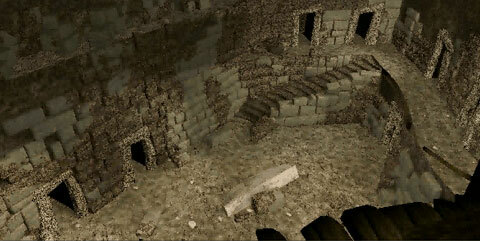 It replaced the map of the well behind the altar in Jewels 1. You could check it at any time and it helped keep track of your progress. The glyphs on the tokens tied in with the glyphs on the map (representing the rooms). 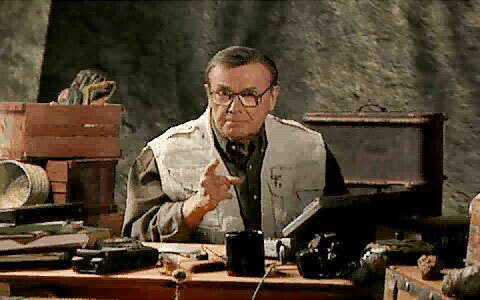 Here's Professor Bhandam (played by Henry Ramer) as the archaeological host of the game. He replaced the talking stone triangle Oracle from the first game. The Professor was there to supply the player with hints (and maybe just a little bit of humour). Henry was absolutely wonderful to work with. What a pleasure! Classy guy! We shot this on a soundstage with a green screen background. The video of Henry was composited into the rendered environment of the game. The DP was David O'Keefe. Video compositing was done at AXYZ by Joel Saunders. Audio was by Bob Burt. I think we did something like 60 clips in one day (whew!) - a very, very long day - what a fab crew! This is the view from the Professor's desk - looking into the underground chamber on the ground floor. I originally wanted a place like this for the first Jewels game, but there just wasn't enough room on one CD for all the "pre-rendered" Navigation movies. By the way - as a technical note - in the mid '90s we had to figure out how to get the computer to let us switch discs without exiting the program - that was a really difficult problem back then. When you moved up to the second floor, you had to change to disc 2. This was almost a deal-breaker. I even looked into authoring onto DVD, but it was way too soon and the DVD format presented all new technical restrictions on the market - almost no one had DVD players back then. Looking down at the ground floor. I loved the idea that walking up the stairs was the trigger mechanism for requesting a disc change. On the second floor, it was climbing a ladder. Of course, if you just used the interactive map, you didn't have to walk around at all, but if you jumped around that way, you were in for some serious disc swapping. This is probably my favourite shot from the game. You are looking down from the bridge on the third level. By going up to Silicon Graphics processors and Alias software (the grandfather of Maya), we could be more ambitious with modelling, texturing and lighting. Just to the left of centre - on the ground floor is the Professor's desk.